Performing even the smallest tasks to show appreciation can go a long way in the workplace, no matter what your rank may be. Making others around you feel valuable is vital for a positive and efficient work environment. Unfortunately, not every company you work for may show you their appreciation towards you and the work you do. 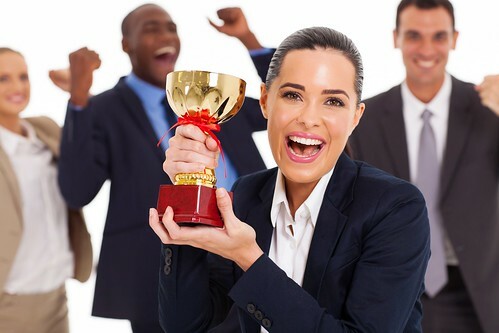 If you’re looking to bring some positivity to your company, or want to show your coworkers your appreciation, here are a few ideas that may help! Something as simple as this mannerism should be obvious, but sometimes it’s not. Telling someone thank you, no matter how big or little the reason behind it, can go a long way. Being told thank you shows your appreciation for the work that others do within your company. It’s amazing to see how far a “good job” can go with some people. Praising, when appropriate, lets someone know that they are performing their job well. To make it even more meaningful, praise someone for their specific actions Take time to notice the little things that people at your company are doing well. Food is always a great way to let people know that they are appreciated. Order in lunch one day, or bring in a dish to share to express your gratitude for the hard work that is being done. Professionals are always looking to grow in their positions, but sometimes it’s important to provide opportunity for workers to try new things and learn about different components of the company. In all, giving opportunity for advancement and training shows that you appreciate the career goals of others and want to help them advance however you can. One idea that we came across was a Celebration Calendar. Post and follow a large calendar with coworkers birthdays and special occasions in your workplace. This gives your workplace more of a personal connection and you will never miss out on telling someone congratulations or happy birthday! Give people the opportunity to get to know one another better. Planning an outing outside of work, allows for a more casual environment for coworkers to talk to one another. Having fun outings also tells employees that what they are doing has not gone unnoticed. Here at Career and Leadership Development, we pass around what we call a “Jam Jar” at the beginning of our bi-weekly meetings. 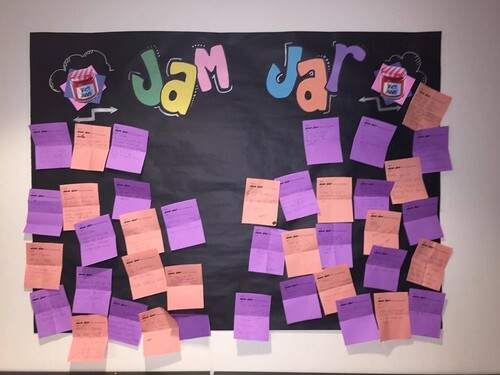 Each staff member writes a “jam” down on a piece of paper and puts it in the jar. These jams are a way to give a shot out to any of our coworkers to let them know that we think they’re doing a great job! It’s a great way to give recognition, while letting everyone in the office know what some people have been doing great! At the end of our meetings, we pass the jar back around, allowing everyone to grab a jam, and go around the room reading off what other people have said about one another in the office. After everyone has gone around, you can see the smiles all around the room. It’s always nice to stop and let people know that their hard work is noticed. I know that whenever someone gives me a shout out it definitely leaves a smile on my face for the rest of the day! As you can tell from the picture above, publicizing appreciation can be super effective as well. We dedicated a bulletin board for the jams that the office wrote about one another and hung it up right where everyone walks by so that we are always reminded of them. 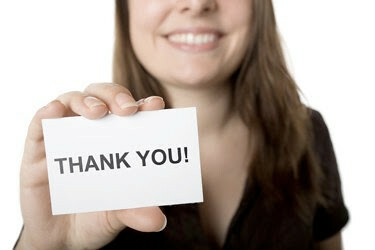 Making your appreciation public is a great way to boost motivation and your team’s confidence! Practicing some of these strategies can increase positivity in the workplace, employees’ morale, and overall productivity! There are many ways to show your appreciation, but in order to achieve positive results, you must be sure to actively try these different approaches with your company!